2 Bedroom/ bathrooms, 5th floor apartment with communal pool and large sundeck. South Ocean Villa Apartments is a development of 19 beautiful apartments all with fantastic views of the Caribbean sea.Situated on the beach between Bridgetown and the night-life area of St Lawrence Gap, there are many excellent restaurants and bars within walking distance. 501 is located on the fifth floor with fantastic panoramic views from both patio areas. There are two air conditioned twin bedrooms (all can be converted into king size beds) The Master bedroom has en-suite bathroom with shower and a shower room with WC is located next to the second bedroom. WiFi is available throughout the apartment along with a 50 inch Internet Smart TV in the lounge and a multi choice TV in the Master bedroom. Air conditioning is available in the lounge (supplement) There is a fully equipped kitchen with fridge/freezer (no dishwasher) They is a large utility room with washer/dryer, iron and ironing board. All floors, including the pool deck) are serviced by a large lift and there is an underground allocated car parking space for one car . Weekly housekeeping service is included. From the pool deck, steps lead down to the board walk, beach and sea. The beach boardwalk is 1 kilometer and stretches all the way to Rockley Beach. The wonderful beach by the Coconut Court Hotel, which is very close to the apartment, offers shade and very safe swimming along with fantastic snorkeling and feeding the fish. A small supermarket, bank, food shops and excellent restaurants plus the very popular fertility clinic are within walking distance. Beach walk to the Hilton Hotel for morning coffee, beach bar at the Coconut Court Hotel which provides lunches and happy hour. A GREAT PLACE TO BE! If you are interested in booking please contact the owner to discuss the best rate. Hi, I'm Sally, I live in Dorset, UK and have owned the apartment since it was built and treat it as my holiday home. In 1982 my husband and I visited Barbados for the first time and we stayed at the Coconut Court Hotel. It was a fantastic holiday and I remember saying to him whilst we were that, " I would love to have a place here one day "....Well years later my dream came true! We are so fortunate to own such a beautiful apartment. It really is a wonderful, relaxing place to stay. It faces the sea and from the balcony turtles and rays can be seen swimming across the coral. The sunsets are amazing to watch.The beaches are never busy and a favorite place to spend the day is just a stroll away on the beach by the Coconut Court Hotel where the swimming is great, the fish love to be fed and the beach bar is a place to meet new friends. Buses to the West coast, Bridgetown, the airport and other areas along the south coast, stop right outside the apartment. 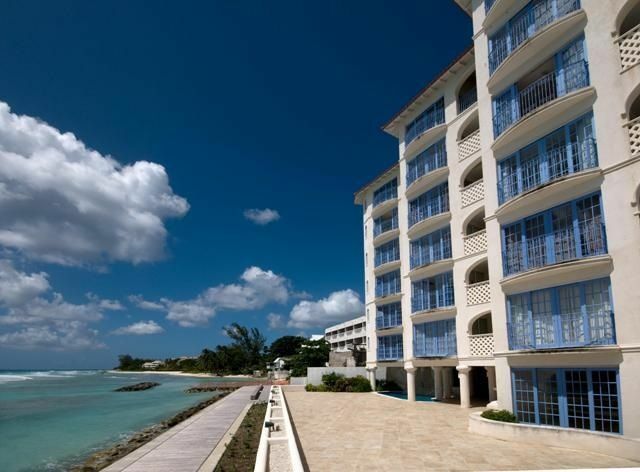 The apartment is beach front with access from the sundeck onto the board walk which stretches all along to Rockley(Accur) beach. We hardly ever hire a car as the buses are so convenient and there are a number of great restaurants and bars in the area. Less than a 8 minute stroll along the board walk to Lanterns, shopping mall where you will find an Imart supermarket, pharmacy, bank, Subway, KFC, local food outlets and other shops. No children under 14 years of age. Air conditioning in all rooms plus ceiling fans. Housekeeping service once a week. Extra housekeeping available at extra cost. Supplement for use of second bedroom. Beach towels included. We had a wonderful week in the beachfront apartment. It was perfect in every way. Secure condo, lovely beach, pool, parking and breathtaking views. Would recommend this place! Lovely condo on the ocean. Thank you, Sally for making our trip to Barbados so enjoyable! Everything in the apartment is as good as the pictures show. Well equipped kitchen, beautiful bathrooms, and everything so clean and well kept. The AC unit in the master bedroom is super quiet. We loved waking up to see the ocean, and such a convenient location, being right on the boardwalk. A short walk to many restaurants and shops. About a 20 minute walk along the beach to Carlisle Bay for some great water sports. So convenient to have laundry in the suite, and we appreciated that there is a drying rack for wet bathing suits and towels. We would definitely love to stay here again! Amazing home away from home. This was my first time in Barbados and I am so glad that I chose Sally's Ocean Villa. It was better than all the pictures and what I imagined. The view is to die for and the ocean drowns out any noise from the road. You won't regret it if you choose to stay here. This is my second stay at this property. This is an awesome location right on boardwalk. You can walk to restaurants and mini market if you don't have a rental car. The building has coded security entry which is an added bonus for me. The apartment itself that I stayed in this year is well furnished and very comfortable and the owner and manager are very quick to respond to any queries or request. Sally's place is amazing! We booked this place for our family (married couple with two boys) and couldn't have asked for more. Swimming in the morning with the turtles while they feed off the coral was unbelievable. We rented a car and toured the entire island and drove the entire coast line in one day. Barbados is a wonderful place to visit, and this location was in a perfect location. Close to Bridgetown, walking distance to shopping and restaurants and evening walks along the boardwalk was spectacular. We will definitely book again, looking at the calendar though it may not be easy! We just returned from a 10 stay stay at this location. Booking was easy with Sally and everything went smoothly. We absolutely loved this place and can't wait to return again. It is in a great location, close to boardwalk, beaches, shopping and restaurants. We are walkers and could easily get around to various beaches, stores, etc by foot. The apartment was large and spacious and modern. We love the front doors that we could open for a absolutely gorgeous ocean view. Everything is just outside your doors, watch or swim with the turtle daily just outside the apartment. It is in a safe location and the apartment is well secured as well. You can walk to boardwalk in front of the unit daily as it is well used. You can also walk at night on the boardwalk and feel very safe. The apartment grounds and unit are very well maintained. We would not hesitate staying here again. Many thanks Sally! Looking forward to a return visit some day. An beautiful apartment on the beach situated very near to the Coconut Court Hotel. Fantastic swimming and snorkelling, feed the fish. Diving nearby. From the apartment watch the turtles and rays swim past over the coral reef. 1.5km beach board walk access from the sun deck which goes all the way to Rockley (Accra) Beach. 20 minute Beach walk to the Hilton Hotel for morning coffee or drive 10 minutes to the Golf Club. Less than 5 min drive to the night-life area of St Lawence Gap for great restaurants and music. Public transportation to Oistins Fishfry, Bridgetown and the West coast, available from outside the apartment. Supermarket, bank and many fine restaurants and bars within walking distance.